Young and old. Beginner and elite. Individuals and groups. A thrilling indoor climbing experience for all abilities. Everyone can enjoy conquering new heights in our spectacular new climbing facility. You don't need experience, equipment or even a climbing partner. 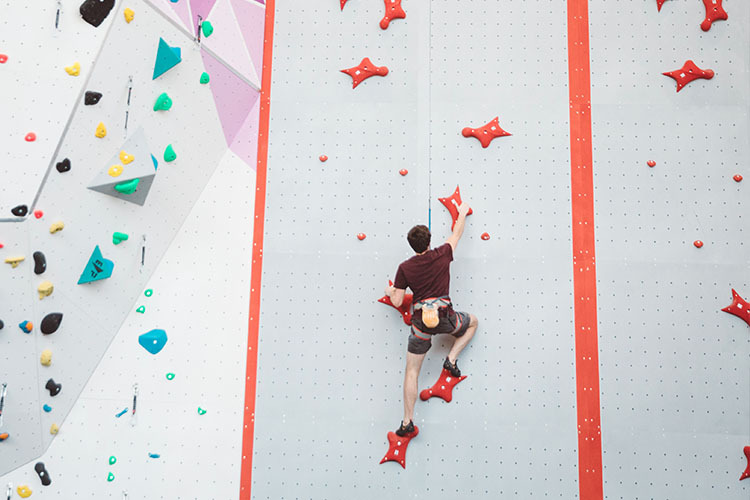 Get your feet off the ground with roped climbing, bouldering and speed climbing options across 706 sqm of climbing surfaces. Stretching up to 15 metres high with a five metre overhang, our walls are an impressive sight. Filled with a huge variety of shapes, textures and overhangs, climbers of all levels will be able to enjoy the journey to the top. And our expert route-setters regularly create new climbs so you’ll never get bored. Regularly changing routes to suit all abilities. Climbing as a group can be a great team building activity or adds a whole new height to a childrens birthday party. Climb without ropes in a large open plan bouldering area. Bouldering is a great way to improve your balance, co-ordination and flexibility. Even little climbers aged four and upwards can enjoy the fun of bouldering. Climb as a family or hire the facility for a unique birthday celebration. Climb up to five metres high without ropes. Clip in, climb, and when you're ready to come down just lean back. Auto belays are great for all skill levels and allow you to climb on your own. Is going fast more your thing? Test your skills and endurance as you race to the top of our two 15 metre speed climbing walls. Come and experience this emerging way to climb that will feature in the Tokyo 2020 Olympic Games. Our walls and overhangs suit all levels of climbers, from new or experienced, to elite climbers looking to advance in the sport. If you're new to climbing, our experts will be on hand to offer advice. And if you're going it alone, our auto-belays let you find your own way and climb solo. Testing routes and overhangs for advanced and elite climbers. Join to just climb or go all in and get much more. University of Warwick student or staff? Log in and discover your available membership options.